Finally! A how-to book by a PROFESSIONAL trainer, performer and clinician on training any horse to learn and perform tricks. Tricks include: bow, count, lie down, sit, act drunk, wave a flag, Arabian Prayer, pedestal poses and much, much more! Secrets of successful trick teaching that anyone can put into practice, making the learning process the fun you've always wanted to have with your horse. 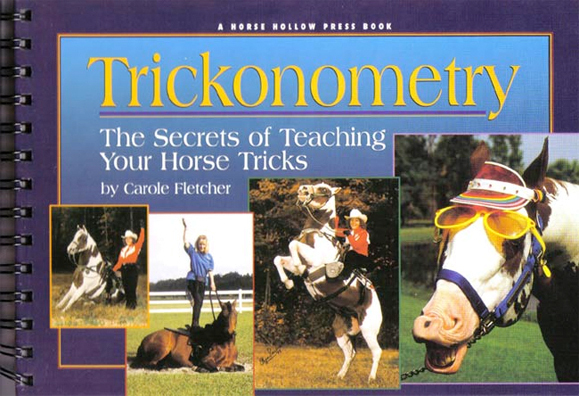 "Carole Fletcher has a unique talent for teaching horses how to enjoy tricks. In this one of a kind book, Carole is willing to share her secrets with loving horse people hoping to enable them to find other ways to have fun with their horses."